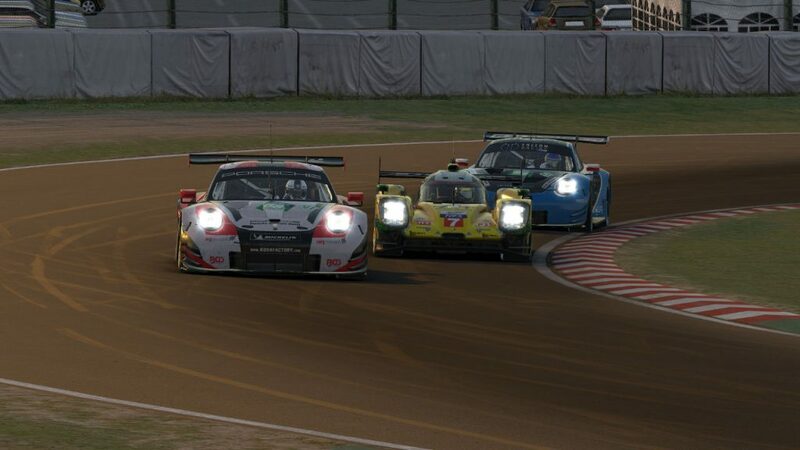 In a season where they’ve proven they can handle anything thrown at them — from new cars to new times of day to literally new heights after taking flight late in the Interlagos race — a new track seemed like it should naturally yield the same result for Thrustmaster Mivano Racing, whose #3 P1 team entered last weekend’s 6 Hours of Suzuka with three consecutive victories. While their quest to extend that streak to four wins started with a pole position for Tommaso Carlà, Mivano’s road to victory seemed more uncertain after the start of the race and the earliest encounters with traffic. Just 12 laps into the race, starting driver Marcus Hamilton lost the lead on the frontstretch when Porsche Basel by Sorg Rennsport eSports’ Mike Nürnberg got past, and Mivano’s bad lap was about to get even worse. 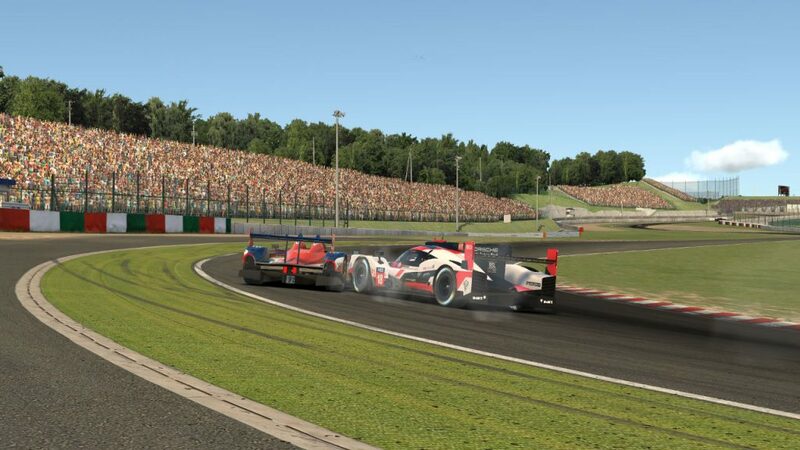 In heavy traffic entering 130R, Hamilton lost his momentum and Wyvern Racing’s Sai Andra made a daring three-wide pass on corner exit to take the second position away. Wyvern makes a three-wide pass for second place over Mivano on lap 12. Hamilton got back around Andra five laps later, but by then, Nürnberg was more than eight seconds up the road, and the ensuing first round of pit stops put yet another hurdle in Mivano’s path back to the front. SimRC.de, which entered the cycle of stops in fifth place, opted not to change tires while the track was still cool, vaulting their driver Claudius Wied up to second place. On those older tires, Wied slowly faded to third while Hamilton managed to narrow the gap to the leading Sorg car to 5.5 seconds before he handed off to Carlà at the next stop. Behind the leading trio, the first two hours of the race were a bit more hectic for the P1 field. For one team, the problems began before the race even started. UI1-Positive SimRacing’s #28 car was penalized for impeding another car in qualifying and given a stop-and-go penalty at the start of the race. The first few trips through traffic caused problems for other teams. Mivano’s #4 entry qualified in sixth but was given a warning for unjustifiable risk and a penalty for causing a collision within the first 25 minutes of the race. That dropped Gabor Mecs as far down as twelfth, forcing the sister car of the championship leaders to make a race-long recovery. SimRC works through GT traffic in the esses. Season-long top-five contender Race Clutch also had a tough run through traffic. On lap 12, they encountered the #41 HPD exiting 130R, and while there was perhaps a bit of indecision on the part of both drivers, Race Clutch’s Richard Arnaud clipped the grass and caused both cars to crash, earning him a penalty as well. Team Chimera suffered collateral damage from the incident, dropping them outside of the top ten and continuing another tough-luck season for the former prototype-class race winners. The first stint was also problem-filled for SimatoK eSport. After qualifying in tenth, they fell back to fifteenth on the first lap when driver David Soranzo had a close call with the #13 MSI eSports car and ran wide in the esses. Later, Soranzo was penalized for avoidable contact with a GT car entering the hairpin. By mid-race, the traffic wasn’t quite as heavy nor the incidents as frequent, but it was still a challenging race for the P1s. Two teams that benefited from others’ misfortune at the start eventually found themselves on the receiving end of penalties. After a clean start and a brief foray into the top five, Odox Motorsport later incurred three penalties for causing a collision, as well as scrutiny from officials and their fellow competitors. The Team Eighty-Four GT car spins after contact from Odox. MSI climbed as high as fourth place before an incident with two GT cars on lap 125 sent them spinning. While the officials eventually came calling with a stop-and-hold penalty, by then it was too late, as MSI crashed in 130R just two laps later to end their race. Indeed, the demands of the Suzuka Circuit proved difficult for several prototype teams to manage, even running all by themselves. Looking for their first top-ten finish since Sebring, AVA Vervatic’s Jurian Groenen was running eleventh when he caught a bit too much grass exiting turn 4 and spun his Porsche into the tires, ending the day for the #23 team. One driver having no trouble with Suzuka was Mivano’s Carlà. By the time he pitted halfway through his mid-race double stint, he had closed to the back bumper of Sorg’s Florian Krüger, and a quicker pit stop by the Mivano crew let their car drive away with the race lead. After that, Carlà routinely lapped more than a second quicker than Krüger to extend his newly gained race lead. The gap opened even more when Sorg collided with the spinning #55 IRDK Endurance prototype in turn 2 on lap 97, which forced the second-place team to pit for damage repairs. Sorg locks up but can’t avoid a collision with the sliding IRDK HPD. Once Nürnberg got back in the car, he had a 30-second deficit, and Mivano’s closers Frederic Evers and Carlà helped keep that advantage until the finish. For the fourth time this season, Mivano came away with the victory while their main competitors — especially Sorg — found themselves mulling over their mistakes and wondering how to top team TMR. It also wasn’t a race without a setback for SimRC. 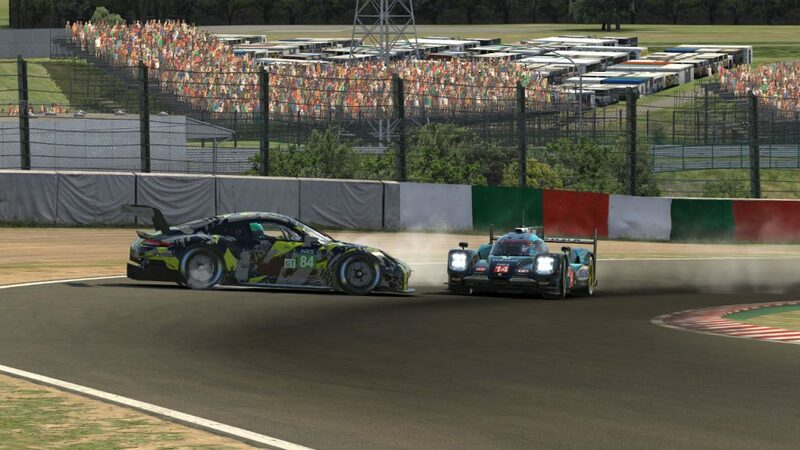 After Wied’s solid race-opening double stint, relief driver Simon Grossman sped exiting the pits, forcing him back in to serve a penalty and dropping them behind Wyvern. They later got the position back and finished in third as the final car on the lead lap. Wyvern finally managed to put together a relatively clean and penalty-free race, showing their potential with a fourth-place finish. Mivano’s #4 team recovered from its early issues to come home in fifth, while Race Clutch also finished one lap down in sixth. 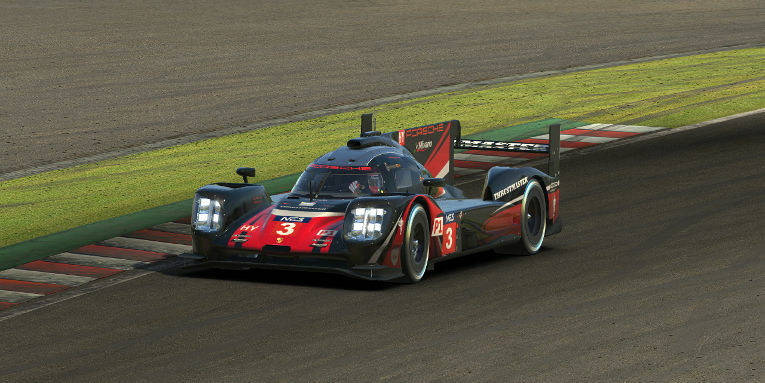 The UI1-Positive SimRacing #28 team of Danilo Piazza and Riccardo Schiavon made a steady race-long recovery from their qualifying penalty to earn a seventh-place result — their best finish of the season that has now put them inside the top eight in points. 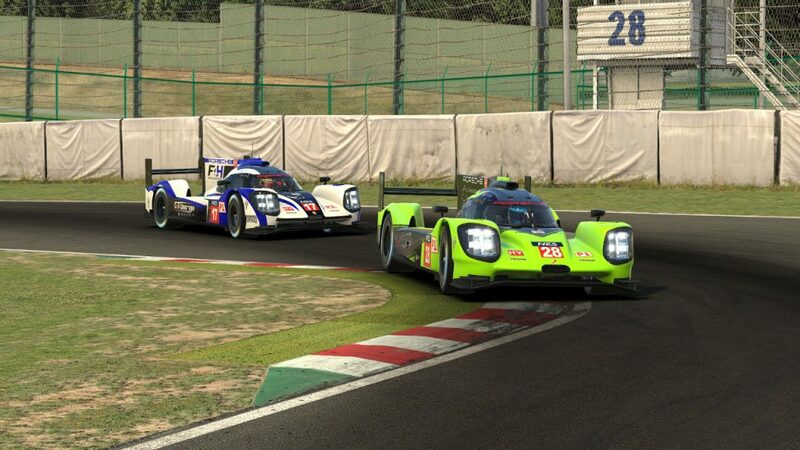 Positive SimRacing’s Piazza and F4H’s Romeo Grinnell race into the Casio Triangle. Team Chimera also had a solid rebound from their first-hour contact entering the Casio Triangle to finish in eighth, one spot higher than where they qualified. With new driver Elliott Skeer in the lineup joining season-long participant Romeo Grinnell, F4H Motorsport had its best race of the season with a ninth-place finish. Rounding out the top ten was the Virtual Motorsport Audi, which despite qualifying in sixteenth managed a more competitive showing compared to its Porsche competitors in the race. SimatoK could only recover to eleventh after its early struggles, while Odox’s trio of contact penalties plus a fourth for exceeding track limits left the Spanish squad in twelfth and barely hanging onto eighth place in the standings. 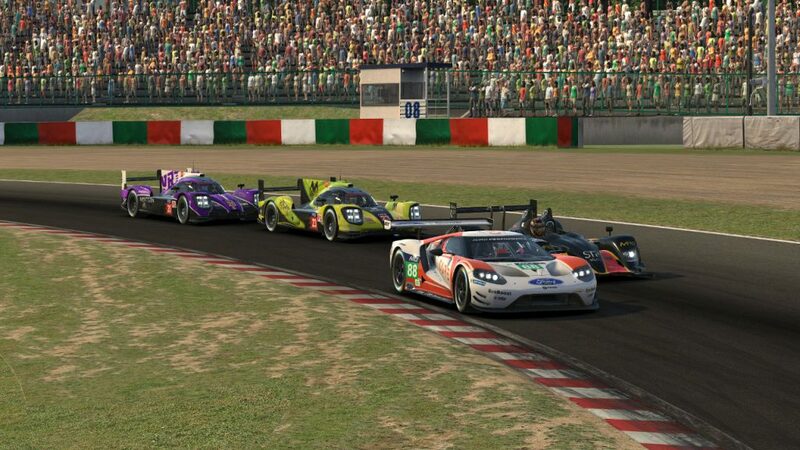 After an impressive showing at times in the Interlagos round, VRTeRacing couldn’t find the same pace at Suzuka. 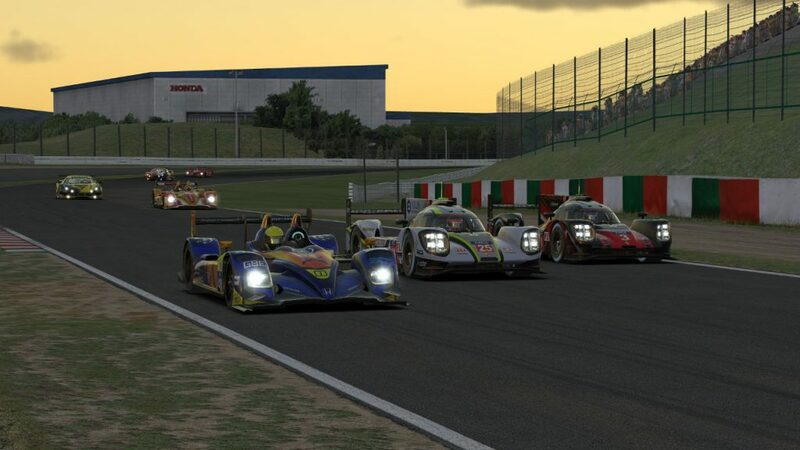 They finished thirteenth ahead of the UI1-Positive SimRacing #27 team, which suffered three penalties during the six-hour race. AVA Vervatic and VRTeRacing battle while stuck in traffic. Torrent Motorsports hoped their race would yield a better result than their last-place qualifying run, but after taking damage in an early incident, they struggled to gain positions and finished fifteenth, earning a single point for their efforts. MSI and AVA’s solo crashes ended each of their races, leaving them as the only P1 teams not to finish. That lack of attrition among the top class may have surprised some within the series, who expected the turbo-powered prototypes to be awkward at best and battering rams at worst around the challenging Suzuka circuit. In this round, mastering traffic was a bit like overcoming a language barrier. Some teams — especially Mivano’s race winners — seemed like native speakers as they carved between classes on the Japanese track. For others, it seemed like something was lost in translation.